Embarking from the first chapter of the [un]known destinations exhibition that took place at the former 1924 Zarifi residence in Kypseli Athens (September - October 2017), curator Dr Kostas Prapoglou activates with the second chapter of the exhibition one of the most significant historical buildings of the area, whose trajectory was in parallel terms with those of all neighbouring buildings including the Zarifi residence. The historic building of the 15th High School in Kypseli. 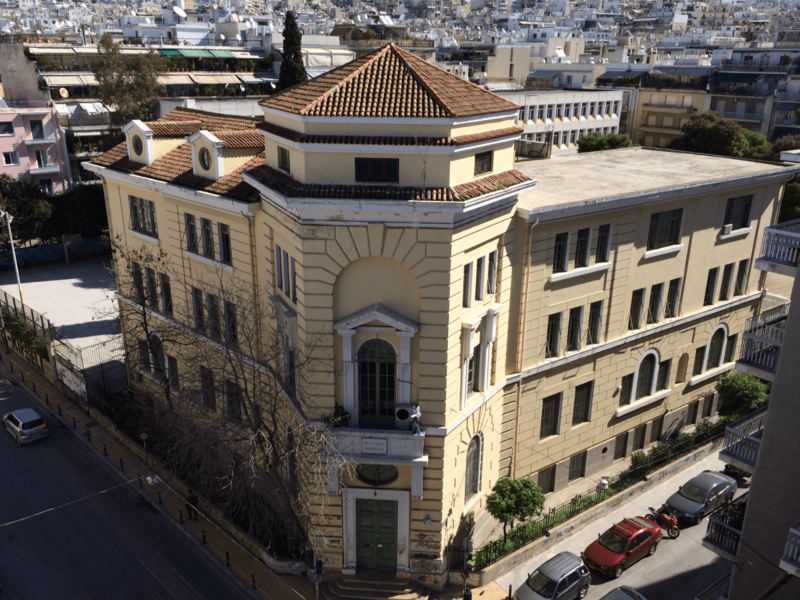 The eclectic building at the crossroads of Kypselis 46 and Paxon Streets was constructed during the start of the 20th century and it was property of the national society of Italian expats in Athens. It was founded as an Italian nuns convent school of the Dominican Order under the approval of the Catholic Archbishop of Athens Louis Petit (1912-1926). Although the architects name remains unknown, it is possible that he was of Italian origin (Buaccaleone) but the building could have also been designed by Greek architect Alexandros Nikoloudis as it carries comparable art nouveau architectural elements to the Sarogleio Institute (Armed Forces Officers Club) on Rigillis Street, central Athens. In 1940, the school was shut down upon the beginning of the Greco-Italian War. 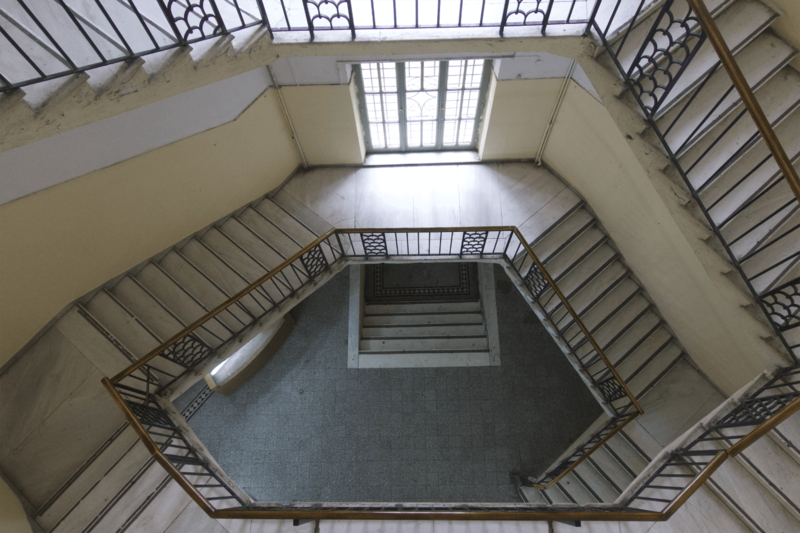 In 1941, it resumed asjust a primary school and was run by the same nuns after permission was granted by the Germans, who connected the building with τhe Evelpidon Military Academy (the oldest tertiary level educational institution in Greece founded in 1828) with an underground tunnel. In 1943, the school seized to operate and it was instead transformed into a hospital for the German forces while the nuns were brutally persecuted and imprisoned. However, some of them did manage to escape to Italy. On March 24, 1945, the building was handed over to the Greek Air Force and it became the General Hospital of the Royal Air Force. In 1976, it was relocated to the district of Katehaki (Goudi) where it still remains. The same year, the building began operating as the 15th Boys High School. In 1981, it was renamed 60th High School and today it functions as the 15th High School of Kypseli. Interior aspect of the building. The negotiation of ideas encompassing the historical consciousness and transition based on socio-cultural and economic constraints that the first chapter of the exhibition surveyed back in 2017, now finds its echo in the 15th High School. Unavoidably, the building has been treated differently due to its unique character and scale. The interplay of an ongoing flux between the private (boarding school) and the public (hospital, public high school) sphere, altered the structure͛s interior space according to contemporary political affairs and practical needs. Re-discovering the hypostasis of the building and its initial use, the viewer of today will decipher an evolution that reflects the liquidity of Greek history galloping through the switching and shifting of multiple realities. The imprint of the passage of one century over the building͛s body reshapes an existing conceptual background but without remodelling its exterior image or form. It remains and raises sturdily as a shellof a narrative that lends its inner self to the ravages of time and human mobility. The surfacing of spatial interference or disruption is primarily linked to human will; it inscribes a noetic and ontological process that its extensions embrace the politics of being, the politics of "I am", "I exist", "I rule", "I construct" and "I destroy". Curator Dr Kostas Prapoglou invites 21 contemporary artists from three generations to discover, through their cross-disciplinary visual vocabulary, their own thread of the story. They will follow the footprints of a mythology that is closely dependent on the location (site-specific) and will respond to its conceptual parameters (context-defined and site-responsive), simultaneously reflecting the reconsideration of values and those multidimensional emotional territories that co-exist and are all linked together. Shell // the politics of being is a journey through the self-portrait of life and history themselves, a documentation of the struggle for survival and advancement. Participating artists: Katerina Apostolidou, Maria Adromachi Chatzinikolaou, Evangelos Chatzis, Mary Christea, Aikaterini Gegisian, Kleio Gizeli, Apollonas Glykas, Yannis Kondaratos, Eleni Lyra, Despina Meimaroglou, Giorgos C. Palamaris, Rena Papaspyrou, Andreas Savva, Dimitris Skourogiannis, Rania Schoretsaniti, Marianne Strapatsakis, Yannis Theodoropoulos, Nikos Tranos, Pavlos Tsakonas, Betty Zerva, Eleni Zouni.